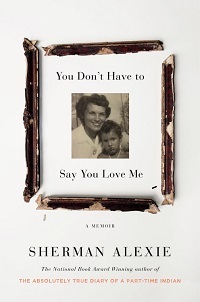 Sherman Alexie’s new memoir is a combination of prose and poetry reflecting on his relationship with his parents, especially his mother; his childhood on the Spokane Indian Reservation; and his adult life away from the reservation. The emotions he expresses are complex and probably couldn’t be easily contained in a clear linear narrative, so he goes for a more thematic structure. There will be an essay about some incident from Alexie’s life, followed by poems reflecting on that incident, then a few more essays, a few more poems, and so on. It’s a journey through memory, rather than a story of a life. I’ve not read much of Alexie’s work, just the novel Flight, so I might be an atypical reader for this memoir. I wanted to read it because I like memoirs, and because Alexie is reputed to be a good writer. I don’t know how much of the story here is presented in his semi-autobiographical fiction and therefore familiar to his long-time readers. What was familiar to me from reading Flight was the mix of sadness and smart-assery. He’s serious, but there’s an overlay of snark. Alexie’s story, as presented here, is painful. He was born with hydrocephalus and had seizures as a child. He was diagnosed as bipolar as an adult and has frequent nightmares. His father was an alcoholic, and his mother was distant and sometimes cruel. He was surrounded by violence and was bullied at the reservation school. His family was poor. He was sexually abused by a neighbor. He felt out of place among Indians and only started to find himself by leaving. As Alexie shares these truths, he acknowledges that they are his truths, not necessarily anyone else’s. Early on, he demonstrates how he’s an unreliable narrator of his own life by making up a conversation with another Indian storyteller about truth. He remembers everything, he says, but he’s also unreliable. I get the sense that he’s going for emotional truth more than literal truth. This book feels a lot like Alexie’s attempt to figure out the emotional truth for himself, rather than to explain himself to other people. Out of all of Alexie’s family, Lilian, his mother, gets the most attention. The book was written around the time of her death, and it feels like he’s trying to understand her and his feelings about her. Along with that, he considers his relationship to the rest of his family, to the reservation, and to the Indian people as a whole. None of it is easy to pin down. I enjoyed reading this. I like Alexie’s voice, and I appreciated the unconventional structure of the book. Life is too complex to fit in a linear narrative, and I think that by not attempting to come up with one truth, Alexie might be close to getting his story right. If you haven’t read his book Reservation Blues, I recommend it – very invested in emotional truth, with blues legends, a Native American rock band, and a local manifestation of divinity all making appearances. I haven’t read that, and it’s one that I definitely want to get to. I like his writing. Because I once knew a habitual liar and writer he befriended, I take anything he says about truth with a very large grain of salt. He’s pretty open here about the fact that he’s telling his own version of what happened and that it shouldn’t necessarily be taken as literal fact. Have you ever listened to his podcast with writer Jess Walter? They’re not doing it at the moment, and I don’t know if they’ll do it again, but I think you can still listen to episodes. They were stellar, very funny and interesting – in one Alexie read a poem about his mother that I hope is included in this memoir. It was amazing, about a bird flying into a glass door or window, and it was about the bird and his mother all at once. I plan to read this book. I haven’t listened to it! I wasn’t even aware of it. That poem is in the book, and it’s lovely.